Parsons Dance, a contemporary company in New York, has taken to the Laguna Dance Festival stage several times over the years. The Laguna Dance Festival marks a 10-year milestone of bringing ballet and contemporary dance to the community. Sitting at Zinc Cafe, reminiscing about the Laguna Dance Festival’s first decade, in lead up to its 10th anniversary this September, founder and director Jodie Gates recalls how the festival began to take shape on that same patio, just a few tables away. It was 2004 and Jodie was talking to a local newspaper reporter about her former career as a professional ballerina, her ideas for a dance festival and her concerns about raising enough funds for the endeavor. A man sitting nearby overheard their conversation, told Jodie that he liked her idea and gave her $100 to get the fundraising started. And the rest, as they say, is history. “[That generous contribution] shows the dedication and love for community that locals here in Laguna Beach have,” Jodie says. Over the past decade, residents of this community and beyond have embraced the dance festival, which has presented 35 top dance companies, 55 performances, 30 master classes and more than 40 free events since its first year in 2005. Desmond Richardson leads a master class for area dancers as part of the festival’s educational programming. This year’s festival, Sept. 11-14 at the Laguna Playhouse, features an impressive lineup including Ballet Memphis, Bodytraffic and Complexions Contemporary Ballet; the New York City Ballet’s Gonzalo Garcia and American Ballet Theatre’s Misty Copeland, a ballet prodigy who got her start not far away, in San Pedro, Calif.; Lorena Feijoo and Vitor Luiz, both of San Francisco Ballet; and “Ekphrasis,” a commissioned music-and-dance piece. The 2014 season will be a celebration and a tribute to all who have leapt, sashayed and pirouetted across the stage over the past 10 years. After traveling all over the world as a principal ballerina with Joffrey Ballet and other premier companies, Jodie retired from her dancing career in 2004 and landed in Laguna, where she enjoyed visiting and had been hosted when performing in Orange County. While getting to know her adopted community, Jodie noticed something was missing. Ballet Pacifica in Irvine, the county’s oldest and only professional ballet company—started by Laguna teacher Lila Zali in 1962—had just folded, leaving a void for this type of performing art in the region. That led Jodie to start thinking about the many dance festivals where she had performed: Spoleto Festival USA in Charleston, S.C.; Jacob’s Pillow Dance Festival in Massachusetts; and others in Edinburgh, Scotland, and Melbourne, Australia. And so, that first year, Jodie called up her friends in the dance world—whom she had come to know through her ballet career—and asked if they would come to Laguna and perform in this festival she was putting together. 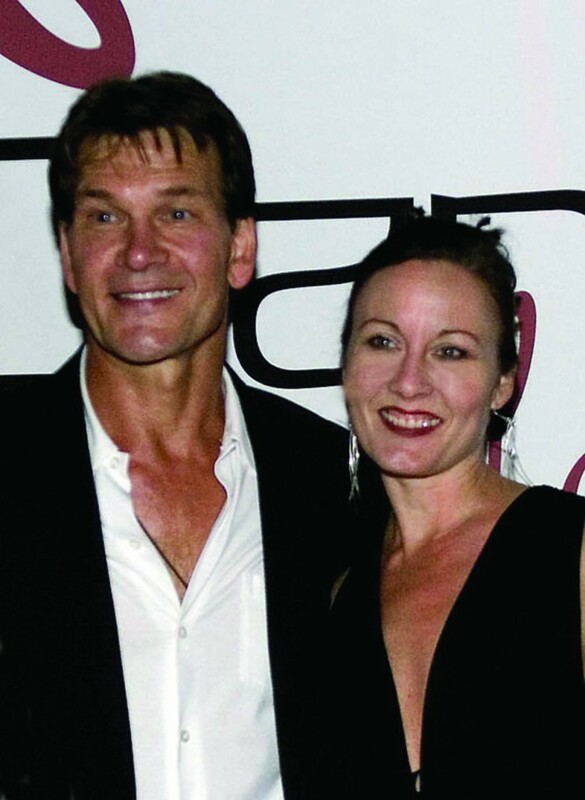 Several agreed, including actor and dancer Patrick Swayze, who would kick off the opening night. The planning and fundraising took a team including Janet Eggers, who served as board president at the beginning and remains an advisory board member; Steve Josephson of Gallimaufry Performing Arts, which served as the festival’s umbrella organization before a separate nonprofit was established a few months after the first event; as well as many board members and past presidents. Nancy, a friend who had opened her home to Jodie when she performed in OC all those years ago and again when she retired, still serves on the board. “She dreamed with me,” Jodie says. One of the things Jodie appreciates about dance is that, unlike a painting, which can be admired for a long time, “dance is fleeting.” It’s an experience—a performance that unfolds before the audience’s eyes, conveying emotion and meaning, and then disappears. “Dance communicates what even the most skilled words can only silhouette,” she says. The Aspen Santa Fe Ballet, a contemporary dance company, performs at last year’s festival. Nancy also has particularly enjoyed Aspen Santa Fe Ballet and was impressed by the Parsons Dance performance of “Caught,” which uses a strobe light to create the illusion of flight as the solo dancer leaps more than 100 times in six minutes. In addition to breathtaking performances, Nancy also appreciates the personal connections with dancers, talking and having dinner with them after a show. “It’s those bonds you can develop with the dancers [that mean the most],” she says. A VIP reception after the Saturday night gala allows attendees to get to know the performers, who also seem to enjoy the interaction. Among the local dancers are Francisco Gella and Erin Holmes, both formerly of Ballet Pacifica, who performed duets in the festival’s early years. Francisco says he felt welcomed and was impressed by the community’s heavy involvement and response to the performances. “It was really amazing to see. … People were eating it up,” he says. Francisco choreographed the pair’s duets—the first was a jazzy ballet number to a mix of tracks by Aretha Franklin and Astor Piazzolla, followed the next year by a romantic ballroom-style dance to “This Time the Dream’s on Me” by Alison Krauss. The first one received a standing ovation and, Francisco says, “I will never forget that moment.” He also has been impressed by top names—“legends of dance”—that have come through the festival. “To be able to have the honor to perform with that roster was a dream come true for me,” he adds. 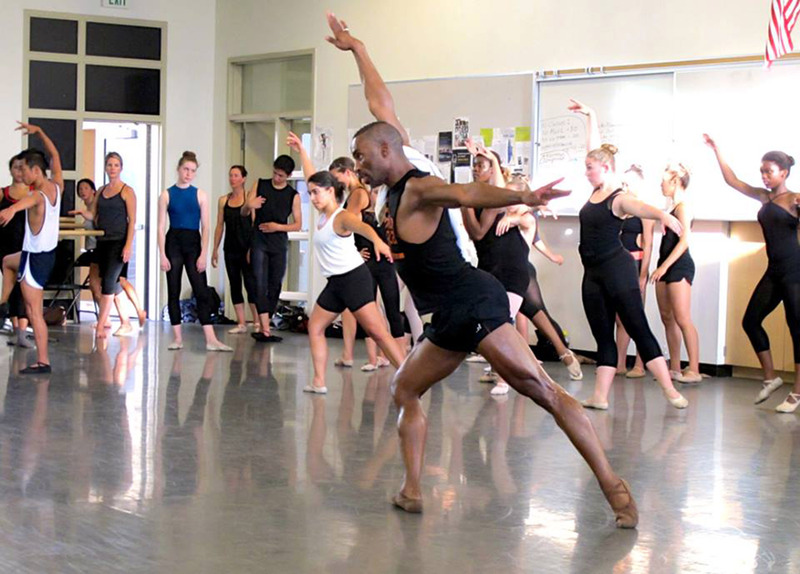 In addition to performances, the festival presents master classes for local dance students, providing a rare opportunity to take pointers from the stars they admire. Jodie recalls a class when Desmond picked a girl for a solo and she was so nervous, she was physically shaking. Desmond offered his complete attention, saying “Just focus … it’s just you and me.” “The moment gave us all chills. … She will never forget that moment,” Jodie says. By any measure, the festival has proven a tremendous success in the past decade, but Jodie is worried about sustaining it into the future. “I’m very concerned about funding for the festival,” Jodie says. Funding—from city grants and individual donations—has not kept pace with climbing costs. Since the beginning, the festival has operated on $165,000 to $185,000 per year; the average cost to bring a nationally recognized company is $20,000, and the festival typically presents several. Add to that the cost of renting the Playhouse for performances, and other expenses. While some of the free events are on hold, Jodie plans to continue public performances during First Thursdays Art Walk in September, which she has done since the beginning to raise audience awareness and expose more people to dance. This year, she plans performances at Dawson Cole Fine Art gallery and two others.